A long day. 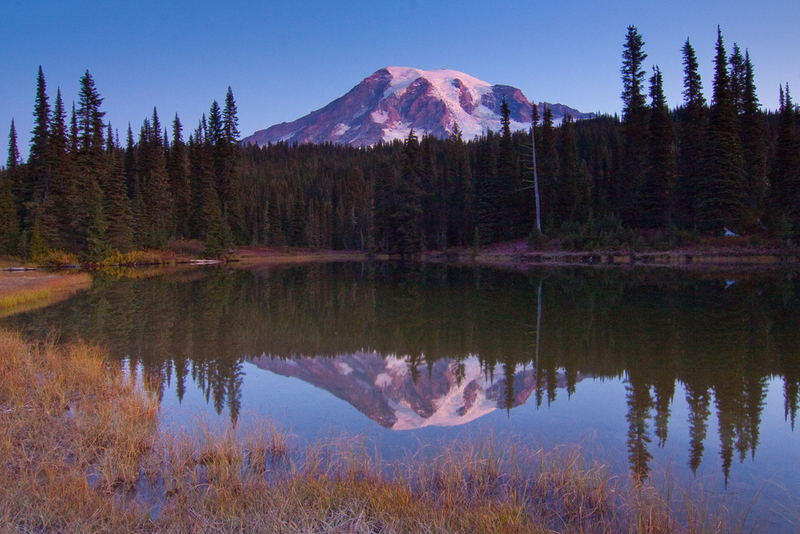 I got up very early to drive to the Reflection Lakes in the hope of getting a nice shot of Mount Rainier at sunrise since the weather was finally clearing up. It was worth the early wake-up call! I arrived still in the dark so I was able to get a picture of the mountain as the first rays of sun touched it and the beautiful image was reflected in the lake below. It was a cold morning and there was frost on the grass surrounding the lake. It was a wonderful and peaceful experience. For this image I used a circular polarizer and a Singh-Ray 3stop soft step ND Filter to balance the light in the scene. 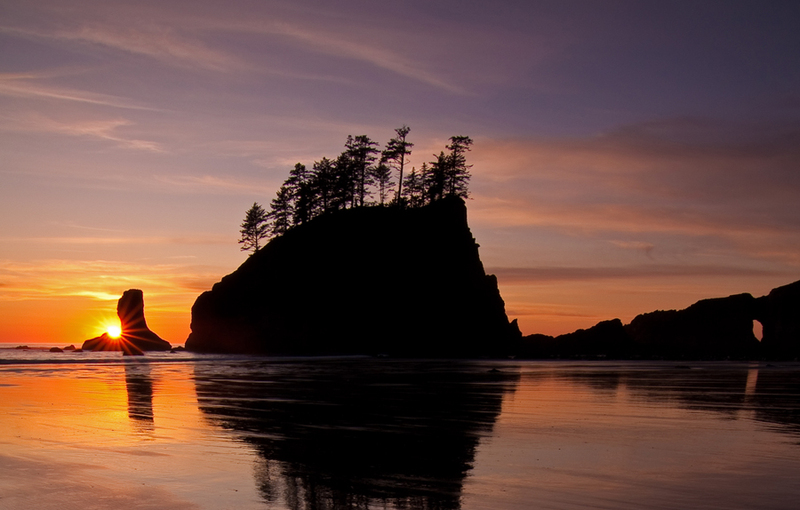 Afterward I headed back to the hotel, packed my belongings and drove 6 hours to La Push on the Olympic Peninsula. I had checked the tide forecast and was happy to see that I should have a nice low tide to photograph the sunset at Second Beach. I had never been to Second Beach before and was quite overwhelmed by the beautiful scenery. There is about a 1 mile hike through the forest and you will already get a glimpse of the sea stacks before you arrive at the beach. I was lucky to catch the sun as it was setting behind one of the sea stacks. 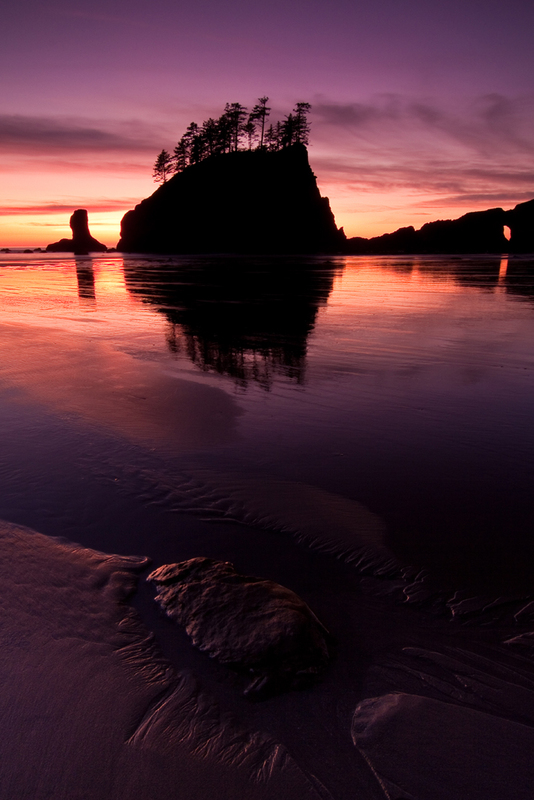 After the sun set, the sky turned into beautiful shades of pink and purple reflecting in the wet sand. Some light clouds arrived just in time to make the sky a bit more interesting. Again, the light in the scene was balanced using a Polarizer and Singh-Ray ND filter.